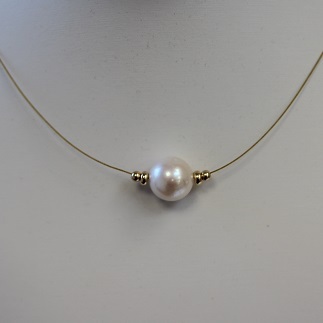 Large pearl illusion necklace made with a single pearl, mounted on gold colour nylon thread and fastened with a 9ct gold clasp. 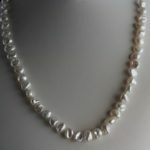 This large 11-12mm cultured freshwater pearl is enhanced with 9ct roundel and ball on both sides for additional detail, made to a standard 17” length. A simple but highly effective pearl necklace to wear with an open blouse for an understated look. 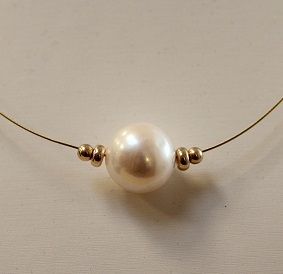 Large pearl illusion necklace made with a single cultured freshwater pearl, mounted on gold colour nylon thread and fastened with a 925 silvergilt lobster clasp. 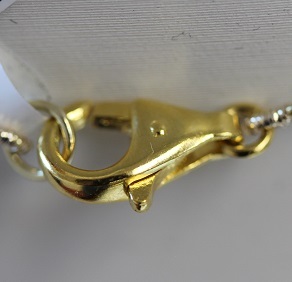 Made for its simplicity and versaltility, this lovely illusion necklace is loved by everyone who wears one – and by everyone who spots it. We find these go very quickly at our shows and events because they are so easy to wear and go with everything. 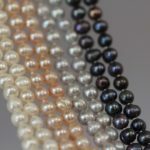 The large 11-12mm cultured freshwater pearl is enhanced with 9ct roundell and ball on both sides for additional detail. 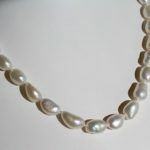 The necklace is made to a standard 17” length. 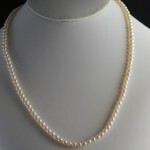 A simple but highly effective pearl necklace to wear with an open blouse for an understated look.